With water rushing around them, sailors aboard the beleaguered USS Fitzgerald faced an agonizing decision. They had made several rescue attempts into the flooded portions of the 505-foot destroyer, which had collided off the coast of Japan with a much heavier container ship early morning Saturday. But they didn't know how many of their fellow shipmates were still trapped inside or even alive, and time was running out. The sailors either had to close off the flooded areas of the ship, or they feared the entire destroyer might go down, according to three active or former members of the Navy familiar with the incident. They decided to seal the doors. By Sunday, the toll of the accident became clear. The bodies of seven drowned sailors were pulled from the areas of the ship that had been cut off. It is not yet clear whether the sailors had already died by the time their shipmates decided to contain the flooding - and it may never be known. "They were in a situation where they had to make tough choices," said one member of the Navy with knowledge of the crisis, speaking on condition of anonymity due to the sensitivity of the case. The worst Navy accident in recent memory is now the subject of multiple investigations by the U.S. Navy and Coast Guard, as well as the Japanese Coast Guard and Transportation Board. Investigators are probing how an agile U.S. warship, capable of speeds of more than 30 mph, loaded with nearly 300 crew members and equipped with some of the most advanced sensors in the world, managed to collide with a lumbering container ship. 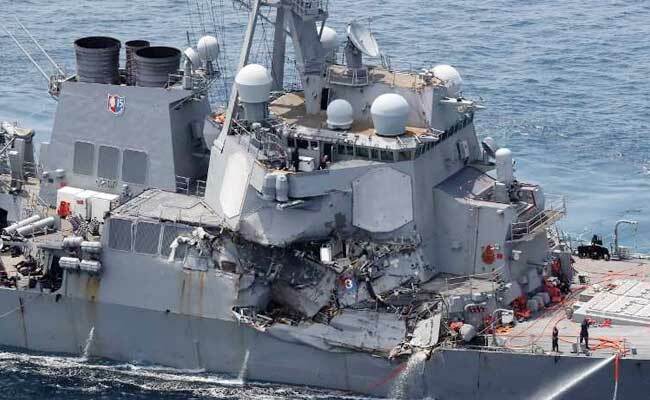 In the coming days, the Navy will download data from the Fitzgerald's Aegis Weapons Systems to help investigators with the reconstruction of the incident, according to Navy documents provided to The Washington Post. The crew from both ships will be interviewed, while the "black box" of the container ship will likely be examined. Capt. Charlie Brown, a spokesman for the U.S. Pacific Fleet, said he would not comment on details of the incident while it is under investigation. Retired Navy Adm. James Stavridis, who was once the captain of the Fitzgerald's sister ship, the USS Barry, said in an email that as a general rule, a watertight door to a flooded area would never be sealed without "knowing that all of your shipmates had escaped." However, he said there are specific exceptions. "In an extremis situation in which the safety of the ship is threatened, and thus the lives of all are endangered, the damage control teams would make those decisions in real time," Stavridis said. The command to close those doors, Stavridis said, would be given by the damage control assistant, who would be in communication with either the captain or the acting officer in charge of ship. A "tremendous" amount of water flooded into the ship, said Vice Adm. Joseph Aucoin, the commander of the U.S. 7th Fleet during a news conference this week. "They had to fight this ship to keep it above the surface. It was traumatic." Sixteen hours after the accident, the Fitzgerald limped back to her home port in Yokosuka, Japan, and the remains of the seven sailors were pulled from below decks by Navy divers. They had been trapped in the forward berthing areas - home to more than 100 sailors - after the bulging, bulbous bow of the container ship, named MV ACX Crystal, gored a 12-foot hole below the Fitzgerald's waterline. The ship's captain, Cmdr. Bryce Benson, also was in his quarters when the Crystal slammed into the right, or starboard, side of the Fitzgerald. The impact almost entirely flattened his room, according to the Navy member. Benson was eventually helped to the bridge, but a decision was made afterward to put the executive officer of the ship in charge and medically evacuate Benson to Japan, according a Navy member. Two other sailors were also taken off the ship, and have since been released from the hospital. The Navy member familiar with the incident said that in retrospect, there was little chance that the Fitzgerald was going to sink because the damage. But he credited the quick actions by the crew with stopping the crisis from getting worse and ensured that ship was able to return to port under her own power. He added that the Navy will review the actions of the sailors involved - including those who drowned - for potential valor awards. Those who died hailed from all parts of America. They included Gunner's Mate Seaman Dakota Kyle Rigsby, 19; Yeoman 3rd Class Shingo Alexander Douglass, 25; Sonar Technician 3rd Class Ngoc T. Truong Huynh, 25; Gunner's Mate 2nd Class Noe Hernandez, 26; Fire Controlman 2nd Class Carlos Victor Ganzon Sibayan, 23; Personnel Specialist 1st Class Xavier Alec Martin, 24; and Firecontrolman 1st Class Gary Leo Rehm Jr., 37. The remains of the fallen sailors were flown home from Japan on Tuesday. Navy Adm. John Richardson, the Navy's top officer, and Master Chief Petty Officer Steven S. Giordano, its top enlisted sailor, were there to receive them, according to Navy officials. Fuel and ammunition are slated to be offloaded from the Fitzgerald in preparation for more extensive repairs, according to the documents, and U.S. shipyards are already lobbying to fix the vessel. Navy officials are also considering putting the Fitzgerald on a gigantic lift ship to bring it back to the United States, much like it did with the USS Cole after it was targeted by a suicide bomber in 2000..